If you were hoping to wear something resembling a childhood pillow you once owned on your toesies, Jeffrey Campbell can help. The DULCE-SH will set you back a cool $160, will undoubtedly get dirty in about .25 seconds, and will definitely get you some light ridicule from your friends, but the point is.. they exist. 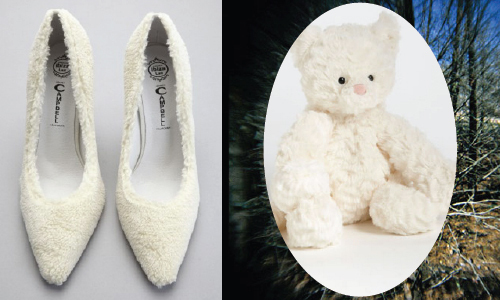 Stuffed animal pumps. And you can buy them here. You can pick up that adorable (G-Rated) teddy over here.